Like Wade Wilson in Deadpool, I’m confused by the timelines, and also by the reinvention of several characters (this Angel bears no relation at all to the Angel of The Last Stand – but as one character observes, “The third in a series is always the worst.”). Set in 1983, X-Men: Apocalypse picks up ten years after Days Of Future Past when Apocalypse, the first and most powerful mutant in the X-Men universe, who has been worshipped as a god since the dawn of time, has awoken. Disappointed by the world he discovers (understandable since this is the Eighties), he recruits a team of mutants to reinvent the planet with a new world order. It's up to Professor Xavier (James McAvoy) and Raven (Jennifer Lawrence) with their own group of young X-Folk to fight back. The production was based, like Days Of Future Past, in Montréal, Québec, at the 27-acre Mel’s Cité Du Cinema facility, where most of the film was shot. This time even the ‘X Mansion’ is now entirely computer generated. 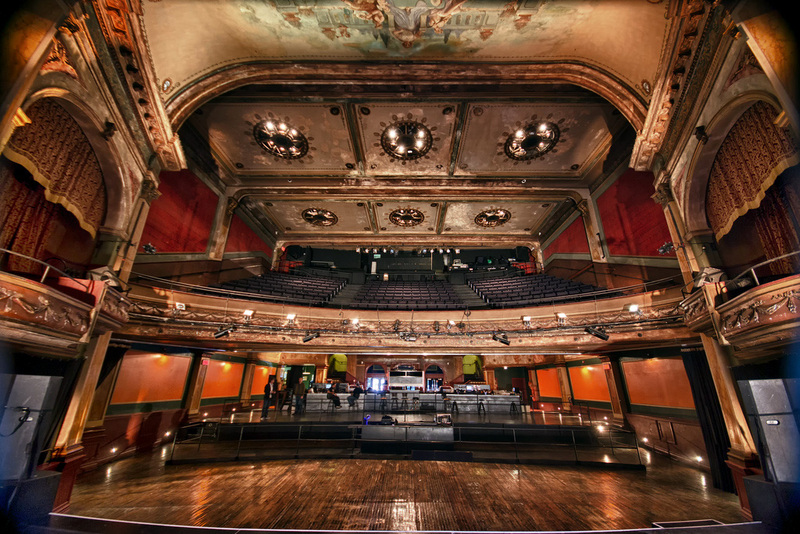 The ‘East Berlin’ fight club venue, where Angel (Ben Hardy) is pitted against Nightcrawler (Kodi Smit-McPhee) was constructed inside the Corona Theatre, 2490 Notre-Dame St W, southwest Montréal. Built as a silent movie house called the Family Theatre in 1912, the Corona retains its original façade and interior despite a fire in 2007. Today it’s a live music and performance venue. Erik Lehnsherr (Michael Fassbender) is living with his wife and daughter in obscurity in ‘Pruszkow, Poland’. The steel mill where Erik works is in Saint-Ours, a town about 45 miles northeast of Montréal. The family’s modest little house in the woods is La Maison Raizenne, oldest house in the village of Oka on the north shore of the Ottawa River, west of Montréal. Built in 1721 by a religious congregation, it lay abandoned for 35 years until being renovated, and was previously seen in 1985's Hold-Up, with Jean-Paul Belmondo. The exterior of the Casgrain Building of John Abbott College, 21275 Lakeshore Drive in Sainte-Anne-de-Bellevue, a western suburb of Montréal, stands in for ‘Auschwitz’ concentration camp, where Apocalypse (Oscar Isaac) seduces Erik/Magneto into joining his band of ‘Horsemen’ by enhancing his powers. The ‘Galleria Mall’, where Jean Grey (Sophie Turner), Cyclops (Tye Sheridan), Storm (Alexandra Shipp) and Jubilee (Lana Condor) introduce Nightcrawler to contemporary US culture with a trip to see Return Of The Jedi, is the Cote-Des-Neiges Plaza, 6700 Côte-des-Neiges Road, west of downtown Montréal, tricked out with an 80s-style tape store and a fake 'Kay-Bee Toy Store'.